Ruben Tejada was at the center of the baseball world during last year's MLB playoffs, when he was slid into by Los Angeles Dodgers infielder Chase Utley, breaking his leg and ending his season. As it turned out, those would be his last moments on the field in a New York Mets uniform. According to ESPN New York's Adam Rubin, the Mets are placing the now-healthy shortstop on waivers, apparently in an effort to save $2.5 million of his 2016 salary. If he goes unclaimed, Tejada will be free to sign with any team. SEE ALSO: Which MLB team has the best uniform? 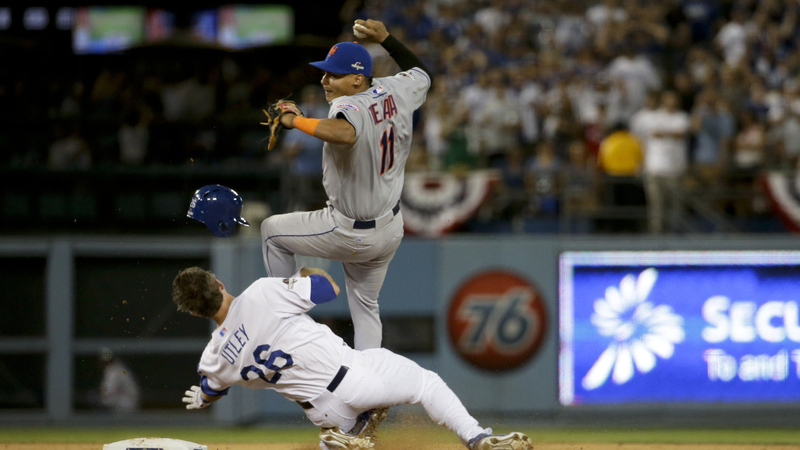 The infamous play at Dodger Stadium last October sparked a controversy and contributed to a rule change announced in February, that should help deter slides like the one that injured Tejada. The 26-year-old joined the Mets organization in 2006 and has been with the major league team since 2010. He was the second-longest tenured Met, only behind captain David Wright. He posted a .255 batting average over his six seasons in New York. The timing of the transaction seems suspect for the Mets, with starting shortstop Asdrubal Cabrera's opening day status in doubt after injuring his knee in spring training. Tejada was slated to serve as Cabrera's backup, and seemed destined to start the season in his place after news of the injury emerged. Teams that could use infield depth ironically include the Dodgers, who may be interested in signing Tejada and creating one of the most awkward situations in baseball. The only things worse than this warehouse-looking place are the metric measurements on the outfield walls. Nothin’ like some fake rocks in center field to really set the mood for a baseball game. The fact that it’s no longer Jacobs Field bumps this down at least five spots. Can this place just stay out of the playoffs just once? Center field is the deepest part of the stadium, guys. The wall doesn’t need to be that high. Relax, Fenway is definitely an amazing place to watch a game. But sitting directly behind a pole and/or facing the left-center field wall just isn’t always appealing.